Ruyton XI Towns Charter Celebrations 1. Can it really be 10 years since the Ruyton XI Towns Charter Festival? A lot has happened in the village since then but perhaps nothing quite like that amazing, pouring wet and freezing cold day on 21st June 2008. I will start this series of entries for www.eleventowns.uk with how it all started. In February 2004 I gave a presentation to the Parish Council in the village hall. It was an open meeting and I wanted to encourage the PC and the public to be interested in holding a big event to celebrate the 700th anniversary of the granting of Ruyton`s Borough Charter. I have to say, there were people out there who thought it was much too early to think about holding an event – after all, Ruyton carnivals were organised in just a few months and were always a success. The result of my presentation was a grant of �0 from the Parish Council and a Charter Committee – Chrissy Niddrie Davies, Tony & Ros Gittins, Keith & Heather Griffiths, Avril Sanders Royle, the late Ann Miller, your`s truly and Stewart our treasurer – to manage the �0!. The ideas flowed thick and fast but the money did not and it soon became clear that there were no grants available to us as this was to be a one-off event – so funds had to be raised. The next four years were spent in raising interest in the project and the significance of the anniversary of our village NOT becoming a town, with the inhabitants being equal to those of Shrewsbury and Hereford and having the same laws as the New Town of Bristol! 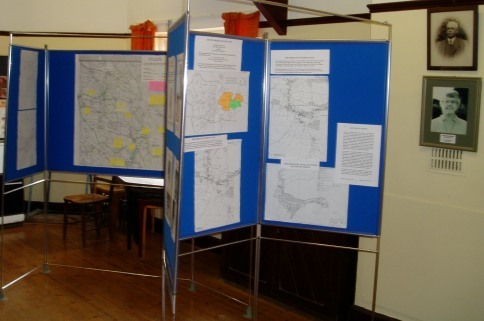 The first event organised by the committee was a Local History Exhibition in September 2004, held in the Memorial Hall – now Caf� Eleven. We made it clear this was just a beginning and a prelude to a really comprehensive Local History Exhibition in 2007. We wanted people to be fired up to tell us stories, lend photographs, letters, etc. to be scanned and saved and for us to photograph items of interesting or historical importance. What a blessing the scanner was, people could knock on the door see their photographs scanned and return home with the precious item with no chance of it being `lost`. Committee members dropped out and new people joined over the 4 years, it was a punishing schedule of organising and planning, especially for those who had jobs to go to. Stewart Ballantyne resigned as Treasurer. However, when Colin Case arrived in the village with loads of management experience, we grabbed him to fill the empty hours of his retirement – he did not have many empty hours after that. There were displays on Ruyton Dairy, Education, maps showing the XI Towns, 18th C Baggy Moor Drainage work on the River Perry,and the Llanymynech to Burlton Turnpike changes to the road through the village. Comparison of the shops now & in the past, and the many changes in the village over the last century. For this we were able to mine the plethora of post cards produced of the only place in Britain world with Roman Numerals in its name. There was children`s village history quiz and an art competition to draw our castle. We were delighted to welcome the Shropshire Family History Society to be at the exhibition to help with any enquiries.